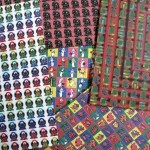 Substances, designed to influence the user’s mental processes are called psychedelic drugs. These substances are quite powerful and able to cause grave troubles. 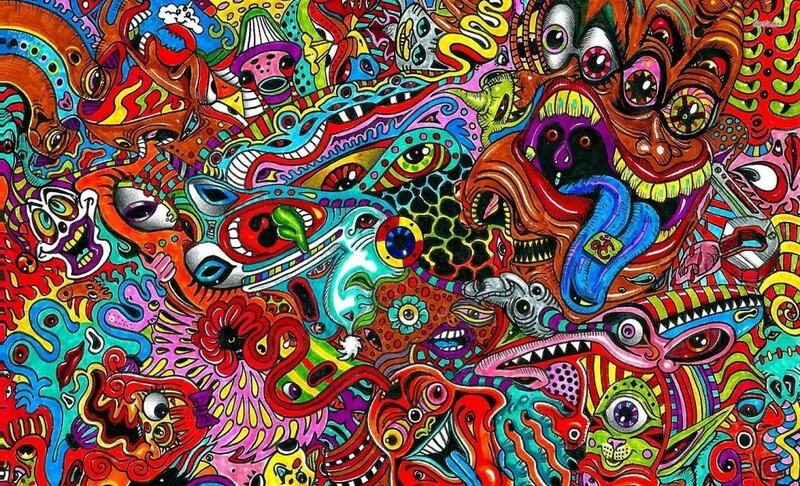 Main characteristic feature of psychedelics is distortion of reality. They cannot make the user see anything purely nonexistent but altered perception changes the actual surroundings. 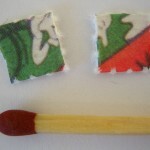 The effect of psychedelics is not always predictable: both “bad trips” and “good trips” may occur depending on many factors, such as the user’s mood, dosage, environment, etc. The action mechanism involves meddling with serotonin receptors in the user’s brain and altering levels of this hormone, which affects mood and cognitive processes. The majority of such drugs are illegal and able to produce harmful side-effects. Lysergic acid diethylamide widely known as LSD is probably the most notorious psychedelic. Its action varies depending on the dose and individual features of the user. 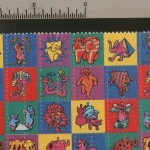 Usually LSD comes as “stamps” – tiny paper rectangles covered with liquid substance – which are to be placed on the user’s tongue. Sometimes the drug is sold in form of liquid drops which may be administered either in on the tongue or to the eyes. There are numerous varieties of these drugs. For a drug user, the most desirable effect of psychedelics is euphoria which involves a sense of excessive happiness, altered time sense, hypersensitivity to overall surroundings, a surge of energy and an unstoppable desire to laugh. Other effects include visual distortion when the user perceives static objects as moving ones, patterns on curtains or rugs may appear “breathing”, rolling in wave-like manner or being 3-dimensional. Colors become exceptionally bright and pleasant while sounds become louder. Most common objects seem to change their shape and color, they melt and distort. All the senses become sharper than ever and creativity increases greatly. 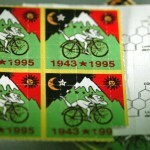 Sometimes LSD serves as a standard to assess intensity, effects and action length of the other psychedelic drugs. Certain kinds of mushrooms contain a psychedelic substance called psilocybin. So-called “magic mushrooms” are grown or gathered and then can be ingested either raw or dried. Dried mushrooms then can be used to make soup or tea. 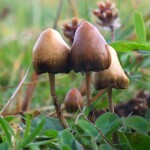 Synthetic psilocybin comes in form of capsules fulled with powder. The chemical formula of the drug is similar to lysergic acid so the action is quite similar, though the effect is considered to be gentler. Psilocybin user starts to experience its effects after half an hour since taking a dose. Regardless of the dosage, the effects involve euphoria, hypersensitivity to sounds and colors, perceptive distortions and relaxation. These feelings linger for 4-5 hours. 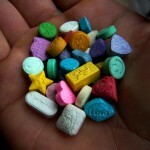 A purified variety of Ecstasy is called “Molly” (diminutive from “molecule”). Both substances contain MDMA (methamphetamine variety) as a reactant. Upon administration these drugs stimulate feelings of overwhelming euphoria combined with a continuous burst of energy and substantially increased empathy towards the others. Both Molly and Ecstasy are distributed as pills or tablets, although the purest Molly is crystalline powder in capsules. The effects are quite persistent and last for 3-6 hours. Morning glory is a widely-spread type of vine, which blooms in bunches of white, purple or blue flowers. Sometimes it is grown at the backyards and produces brownish or black seeds. Once consumed, the seeds produce prominent psychedelic effects by increasing sensitivity to various stimuli like colors, textures and sounds. Perceptive distortions are also present, so the user may describe it as “hearing textures” or “feeling colors”. Active ingredients of morning glory seeds are similar to LSD and the effects linger for 3-4 hours. One of the freshly-emerged drugs is Smiles, properly referred to as 2C-1. Its contents and action are similar to other popular illegal drugs: “Bath Salts,” “fake weed” and K2. Teenagers prone to take this family of synthetic designer drugs for two major reasons: they are easy to acquire and common blood tests show no presence of the drug. Smiles is a fusion of amphetamines (which act as stimulants) and hallucinogens, so it has a two-way effect. This drugs comes as a white crystalline powder, pills or tablets. The drug may be consumed through the nose or ingested (possibly, in combination with other substances). Designed drug means that associated amphetamines are chemically altered and induce slightly different effects. Nevertheless, general action involves euphoria, burst of energy and sensory distortion. Hallucinations are also quite probable. Ketamine is a veterinary painkiller. It is known under various nicknames: Super (Special) K, Vitamin K, Kit Kat, LA Coke, Super Acid, Ketaset, etc. The main difference from the aforementioned drugs is that Ketamine is not totally illegal, it is used as a prescription-only medicine. Unfortunately is is lso widely used for recreational purposes. 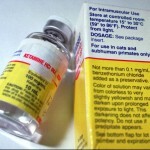 Ketamine is sold as a transparent liquid or whitish powder. It can be administered in almost any way – users can inject it, ingest or smoke (often in combination with marijuana for an increased effect). Abuse of Ketamine involves hallucinations depending on actual surrounding, side-effects include confused mental state and short-term amnesia. Perception of sound and light can change drastically and out-of-body experience may be achieved. This effect usually occurs after taking substantial doses and often described as terrifying. Not unlike Ecstasy, this substance is commonly taken in clubs and rave parties. 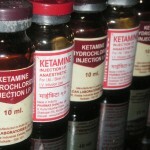 Regular administration of Ketamine results in tolerance which makes users consume increased quantities of the drug to achieve psychedelic effects which usually last for about an hour. A substance with a prominent hallucinogenic effect, mescaline, is produced from a cactus called peyote. In order to experience its effects, cacti are cut, dried and chewed. The other way of consumption is to is to prepare a water infusion. A typical dose of pure mescaline varies from 0.3 to 0.5 g which accounts for about 5 grams of dried peyote. The action of the drug is extremely continuous – up to 12 hours. The experience from taking this drug combines visual hallucinations with severe alteration of cognitive processes. Often these effects are pleasurable but sometimes they can induce fear. Similar to other psychedelics, peyote often creates a feeling of euphoria, its physical addictivity is not proved. 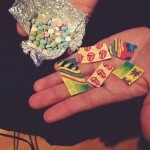 The most popular psychedelic drugs. 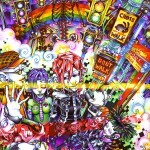 A psychedelic trip. Hallucinations. Drug ketamine. Anesthetic, analgesic, sedative. Ketamine causes hallucinations, agitation and a long period of disorientation, psychosis. 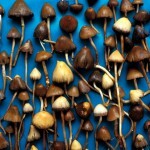 Psilocybin mushrooms. 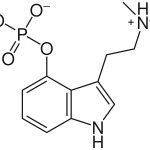 Psilocybin is a naturally occurring psychedelic compound.